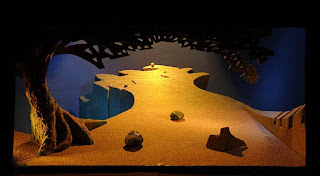 We just saw Tristan at the Chicago Lyric Opera, with David Hockney's magnificent 1987 set designs (click to enlarge). What a work it is. Somehow, though it is one of my favorite works of art in any medium, I had never seen it performed live before. I've been wandering around in a daze ever since. Even after his break with Wagner, Nietzsche affirmed the greatness of Tristan: “Even now," he said, "I am still in search of a work which exercises such a dangerous fascination, such a spine-tingling and blissful infinity as Tristan — I have sought in vain, in every art.” He was right, as he usually was about works of art. I guess one reason I was not over-eager to see it in the flesh is that you never seem to see Wagner performed nowadays unless the production deliberately distorts the work in some way or other. Shakespeare also gets this sort of special treatment: The Tempest presented as a criticism of British imperialism, etc. Chicago's Wagner performances have been especially egregious in this regard. Several years ago they had the amazing chutzpah to present The Flying Dutchman with a conventional happy ending. Instead of the Dutchman's ship sinking beneath the waves and Senta hurling herself off a cliff, they had the happy couple walking arm in arm down the beach, presumably to get married and raise 2.5 children. Then there was that unforgettably awful staging of the Ring, in which the Ride of the Valkyries was indicated by girls jumping on trampolines. 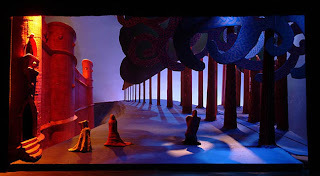 One reason I thought I could afford to see Tristan at last is that I saw Hockney's designs: they do bear some resemblance or relation to what Wagner intended us to see on the stage. Of course, since this is Chicago, the producers could not resist messing with the work. At the end, as Isolde sings the Liebostod, they had her standing with arms raised exultantly, a gesture that philosopher Roger Scruton has compared to that of a football player doing an end-zone victory dance. Then, instead of her collapsing and dying in ecstasy, they had her, through a trick of lighting, disappear. Scruton thinks this messing-with-the-text is not a matter of childish vandalism, but an inevitable result of the fact that there are ideas in Wagner, such as religious self-sacrifice, that are no longer available to modern audiences, except "between quotation-marks." He's partly right of course, but I don't think this explanation is sufficiently general. It doesn't seem to explain why the same sorts of people mess with Shakespeare. Personally, I lean toward the childish vandalism theory, though I admit that it is not much of an explanation. It leaves questions unanswered. Regardless of what you think of Wagner, isn't it obvious that you should be more interested in hearing what he thinks of love, death, and redemption, than in hearing what some Chicago opera producer thinks? And how on Earth could that producer possibly ignore that obvious fact? How can such people possibly have the temerity to substitute their ideas for his?